How does a course admin create and allocate groups? Groups allow a number of students within a course to share, discuss and collaborate within a smaller community. As a Course Administrator, you can create these groups and allocate students to them. Go to Course Setup and click Groups. At the top of this page, you will see a list of Group Types. By default, every new course comes with two types of groups. Tutorial Groups which are private and open only to invited students. To find out how to create a new Group type, see How do I create a new Group Type? 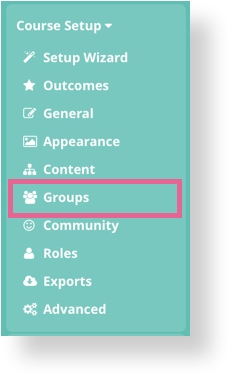 Scroll to Add and Manage Groups where you can create new groups in different group types. Select the Class and Group Type you would like to manage. To add and create a new group in that Class and Group Type, scroll to the bottom of the list and start typing the name of your new Group in the box below. Once you've written the name of your new group, click Add. Your new group should now appear in the list of groups. Go to Add and Manage Groups, where you can also allocate students to groups. Next to each Group, you have the option to Add Members. Click on the box to search for a student and click on their name to add them. You have now added a student to that group. To find out how to do a bulk group allocation, see How does a course admin manage group allocations in bulk?